The fashion industry has an enormous environmental impact. The United Nations estimates that 10 percent of total global greenhouse gas emissions come from the fashion industry. According to the U.S. Environmental Protection Agency, 13 million tons of textiles are tossed into landfills every year, which makes up an estimated 9 percent of total landfill waste. 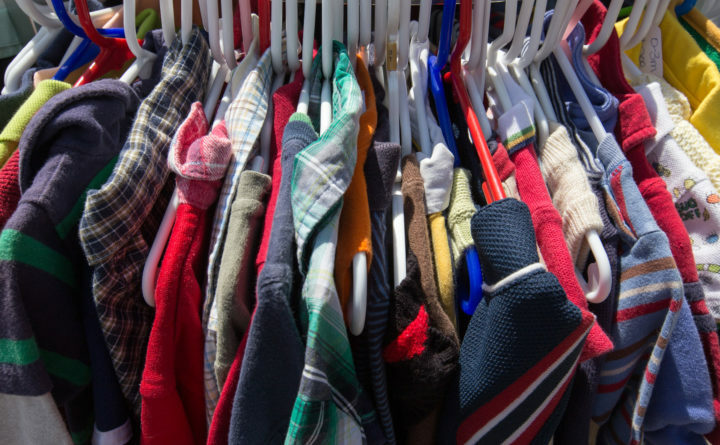 If you are looking to reduce the environmental impact of your wardrobe, you could consider a number of steps, like buying used or recycling old clothes. If you are going to purchase new clothes, though, you can make more conscious fashion-buying choices when it comes to materials. When it comes to production and waste, fabric matters. The material clothes are made from take a lot of resources, and processing these materials uses energy and chemicals that can also negatively impact the natural world. Synthetic fabrics like polyester are made from nonrenewable, fossil fuel-based materials. Even natural fabrics have an outsized environmental impact when you consider the resources used to produce new materials. There are fabrics that are better than others when it comes to sustainability. Indexes like the Higg Materials Sustainability Index, the Textile Exchange Preferred Fiber & Materials Benchmark and MADE-BY Fiber Benchmark rank materials based on different parameters like greenhouse gas emissions, toxicity and resource use. Such rankings are not completely cut and dry, though, because of the complexity of the fashion supply chain and the variability across the industry. The way the clothing is dyed also matters. The dyeing process for clothes can be chemically intensive, and the runoff from the process winds up polluting waterways. An article of clothing can be made from a sustainable material, but it could be dyed using a chemically-intensive, toxic process. Cline said the best bet for buying sustainably sourced and dyed clothing is to check the certification for the fabric you clothes are made from. She said the Global Organic Textile Standard (or GOTS) is the most thorough, though certifications like bluesign, Cradle to Cradle and OEKO-TEX indicate safe chemistry was used in the dyeing and processing of textiles as well. There are some materials that rise above others in terms of sustainability, particularly natural fibers that are made from biodegradable, renewable materials. Linen, a lightweight breathable fabric made from flax, and hemp are particular standouts among natural fabrics. Both flax and hemp require little water to produce when compared to crops like cotton. The flax used to make linen also does not require chemical fertilizers or pesticides, and hemp plants have the ability to replenish the soil. These materials make up only a small share of the American fabric market, though Cline is hopeful that we will see more in the United States soon. “There’s been a change in legislation in the United States so farmers are legally allowed to grow hemp for textiles for the first time since the 1970s, which means we are going to see more hemp in the marketplace,” Cline said. Cotton is also a natural fabric, though conventional cotton is often cited for its outsized pesticide use and water requirements in the water scarce regions where it grows. Organic cotton, which is labeled either through GOTS or Organic Content Standards (OCS), is managed in a more water-friendly way and is harvested without any toxic pesticides, synthetic fertilizers or genetically modified seeds. Some natural fabrics are made from animal fibers and skin. Silk, for example, is a natural fabric made from silkworms cultivated from easy-to-grow, pollution-resistant mulberry trees. Some animal-rights activists, however, take issue with the fact that the critters are boiled alive in order to produce the thread for the soft, shiny fabric. Ahimsa, or Peace Silk, is made from naturally shed silkworm cocoons, but the fabric is generally less lustrous and more expensive, and even when silkworms are allowed to emerge as moths they live short lives where they unable to independently fly or eat. Leather and wool are also produced using animal products (the hides of cows and the fleece of sheep, respectively), but the environmental impacts of producing their raw materials is more evident. While silkworms hardly have a carbon footprint, ruminant animals like sheep and cows contribute millions of tonnes of methane, which the Environmental Defense Fund says is 84 times more potent than carbon dioxide, to global emissions every year. Still, the quality of the materials can lend to their longevity and, in turn, their sustainability. Organic wool is durable, naturally wrinkle-resistant and easily holds colorful dyes without use of chemicals. Wool can also replace many of the water-resistant synthetics and polyester fleeces that feature prominently in outdoor gear. Leather is a little more controversial because it is made from cow hides and the tanning process can use a wide array of toxic chemicals, but Cline noted that if a leather piece is used longer than its synthetic counterpart, it can still be more sustainable overall. There have been forays into more sustainable plant-based alternatives for these fabrics. Piñatex, for example, is made from pineapple leaf fiber. Most “vegan leathers,” however, are made from plastics and nonrenewable materials like PVC, which Cline said is much worse than leather in terms of sustainability. Recycled artificial fabrics are also slightly more sustainable than their newly-manufactured counterparts. “Any recycled material, recycled polyester or recycled nylon, is a lot more sustainable because it requires a lot less energy and water to make and, obviously, no virgin resources,” Cline said. However, St James noted that the recycling process for synthetic materials can use a lot of energy, and even recycled synthetic fabrics can contribute to plastic waste through microfibers shed in the washing process. But, as Cline pointed out, recycling polyester and nylon takes “dramatically less energy” than creating new synthetic materials. She added that while the microplastics are a problem for the fashion industry in general, there is “a lot about that that we don’t know.” New research on microfibers in the ocean show that there are fibers coming from cellulosic fibers like cotton and viscose-rayon as well as plastic. According to most experts and professional indexes, synthetic materials rank below their natural counterparts on nearly all measures of sustainability. Even synthetic materials billed as eco-friendly should be considered carefully. “People need to be very careful when they buy clothes in the viscose-rayon family,” Cline said, which include, modal, viscose and rayon. Though they are made from tree fibers, which are technically a natural, renewable resource, they have to be processed through lots of toxic chemicals to become fibers. Plus, the production of new viscose-rayon materials have been known to contribute to deforestation around the world. Bamboo, which Cline explained was often billed as an eco-friendly fabric until the early 2010s when the Federal Trade Commission cracked down on its labeling, falls into this category. There are eco-friendly alternatives in the viscose-rayon family. Fabrics like TENCEL™ and Monocel® are forms of lyocell, which is produced by soaking wood pulp in a reusable, non-toxic chemical solution to extract the hardy cellulose found in plant cells and spun into fiber.